Just Democracy  Partido X. The text first drafted by the X Party was amended and corrected by the citizens from January 29th to March 18th in 2013. With real democracy citizens can have a say and the control over the decisions that affect us. Real power should be in the hands of the citizens and must be based on the distribution of the control on the government by means of several channels of collaboration, vigilance, participation and decision making. Society works best when it incorporates citizens’ expertise and the innovative strength of its civil society. Now that the information and communications technology allow it, it is time to include in the forms of government the ability of society to directly improve their institutions and laws. The proposed method takes into account that a society like ours has to get used gradually and at different intensities depending on the capabilities of each one, to not delegate and to remain vigilant on legislators, institutions and governments. We never start from scratch: there is already well established knowledge that must be made the most of and further strengthened. It is for this reason that the X Party is not trying to be the solution, but rather a catalyst of solutions. Citizens should be able to participate when they believe is appropriate and depending on their knowledge, needs and interests. This does not mean that everyone needs to know about everything, nor does it mean that everyone should participate at the same pace, but it does mean that every citizen that wishes to will have the tools needed to be informed and control the decisions that affect them. This is where the #JustDemocracy programme kicks in. Implementing only one or some of the mechanisms that comprise it would create imbalances that would keep us away from goal, Just Democracy … period. The very essence of democracy is the knowledge of society about the government rulings that will affect their lives as well as the control over the decision making process. What is more, transparency in public accounts (and not budget cuts) is essential to regain the trust of investors and the markets. 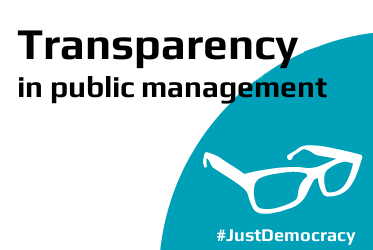 Transparency in public management cannot be optional; it must be obligatory in all areas of the administration or public institutions that manage funding, financial aid, subsidies or public assets. It also must be so in all private institutions that receive public funding as well as in every business that provides services with a quantifiable impact on around 10% of the population. Documents will not have legal validity if they are not published and made available to citizens, both online and in paper. This is the only effective way to put an end to corruption. Furthermore, as a general rule, all of the representatives’ chamber sessions in all territories and their commissions must be broadcasted publicly. Wikigovernment is the result of a democracy that includes citizen participation to develop and manage common matters. It allows citizens to prioritise the initiatives of the different governments and institutions as well as providing inexpensive and straightforward channels in order to present law initiatives that could become government actions. Wikilegislations are laws established between citizens and governments in a collaborative and transparent manner. 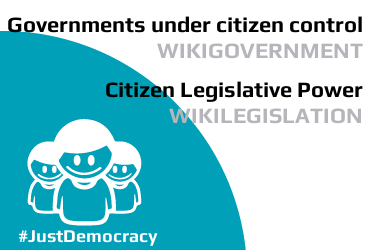 A Wikilegislation always starts off with a draft put together by citizens and experts on the specific field. Afterwards, an information effort is essential in order to enable anyone to become interested in the issues addressed, be documented and understand them. This is as much for the participation in the process as it is for the observation of it, should this be desired. The most developed examples of Wikigovernment are the Digital Cabinet of the state of Rio Grande Do Sul in Brazil (with a population of 10.7 million citizens) as well as the incorporation of Better Reykjavik to the government of the Icelandic capital. In the Digital Cabinet there have been 160,000 people involved in its different consultations and it has received more than 360,000 votes and more than 3400 proposals. As far Wikilegislations are concerned, the most developed experience is the Brazilian Civil Rights Framework for the Internet, in a country with a population of 196.7 million citizens. We can all have different ideologies and as a result choose to vote in different ways. But this is usually used to divide us on other matters on which we would potentially be in agreement because they benefit a vast social majority. For this we demand the permanent right vote, not to use it all the time, but to use it when we consider appropriate. Of course, we can be and don’t want to be making decisions on every matter all of the time, but we demand the right to vote on issues that interest or affect us and we consider that the representatives that we have chosen cannot represent us correctly. In order to make this possible, the opportunity to vote on all laws debated in Parliament has to be established; through the Internet using the electronic NID system or by traditional paper vote, in duly authorised voting points. 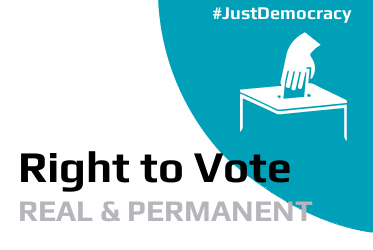 The right to a permanent vote constitutes a means of effective vigilance on behalf of the citizens, forcing representatives to offer appropriate explanations of each law project. This resolves the problem of popular legislative initiatives (PLI) presented by the citizens being systematically ignored by the Congress. Ultimately, it is a matter of regaining and exercising our sovereignty by means of voting when we want to. Without handing out blank cheques. The referendum will be binding, that is to say, whatever is voted for in the referendum will have to be fulfilled. Of course, it will never be possible to put forward in a referendum legislative initiatives that violate fundamental rights. 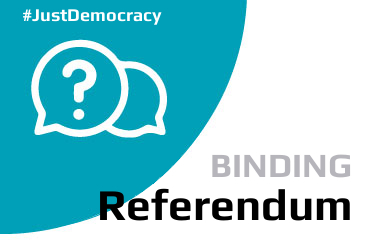 When a sufficient number of signatures have been collected, a referendum of a binding nature will be carried out. To decide on changes in the Constitution and in Organic Laws, on the adherence to international treaties and supranational security organisations and on their reforms. In a timeframe of 90 days since the publication of any law or decree, 1% of the citizens in the competency area can demand a recall referendum to be held. In order to call a state referendum, it would be necessary to collect the signatures of 2% of the population over a period of 9 months (6 months for a regional or local referendum). A quorum of 55% will be required in order for the referendum to be binding. Finally, the acts put to a vote will be passed by a simple majority, with the exception of constitutional reforms and organic laws, which will require a qualified majority of three fifths. Having transparency in public administration, Wikigovernment and permanent right to vote, referendums would only be used in rare cases that affect major legislations. The country with the highest benchmark of the use of a referendum is Switzerland, a country with a population of almost 8 million citizens in which a total number of 208 initiatives have been voted between 1990 and 2012 by means of popular federal votes (these include obligatory and optional referendums as well as popular initiatives) split between consultations that tend to take place three to four times per year, with an average participation rate of around 43.2% of registered voters.